There is much more to the state of Tamil Nadu than just temples. It is one of the foremost tourist destinations of India because of the variety that it has on offer. The magnificent temples, the lofty hills of the Nilgiri ranges, the azure waters of the sea, the lovely golden beaches are all there for you to explore in your tour to Tamil Nadu. In addition to this there is Wild life in Tamil Nadu. The Wild life in Tamil Nadu reveals yet another interesting aspect of this state. So long the Wild life in Tamil Nadu was ignored. This aspect was given less importance in contrast to the temples and hills in the tourism scenario. However it is recently gaining popularity and the tour operators are even conducting Wild Life Tours in Tamil Nadu. The topography of the land is very diverse. More than seventeen percent of the total land area of Tamil Nadu is covered with forests. The forests cover the plains as well as the mountain slopes. The vegetation of the Tamil Nadu forests range from dry deciduous forests to moist deciduous forests. In addition to thorny trees and scrubs, mangroves, evergreen forests and grasslands are also found in these forests. 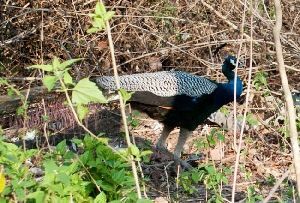 They are home to the rich and varied Wild life in Tamil Nadu. There are as many as 5 National parks and 17 Wild Life Sanctuaries in the state of Tamil Nadu where you can witness the amazing Wild Life in Tamil Nadu. Many rare and endangered species of animals dwell here. It is indeed a great experience to be visiting the various wildlife destinations in Tamil Nadu and seeing the wild animals that are not to be seen elsewhere. The Wild life in Tamil Nadu includes animals like Chital, Wild boar, Bonnet macaque, Black Buck, Flamingos, Teals, Gulls, Terns, Plovers, Stilts, Langur, Bonnet Macaque, Tiger, Leopard, Wild Dog, Hyena, Jackal, Sloth Bear, Sambar, Spotted Deer, Indian Muntjac, Mouse deer, Rodent, Flying Squirrel, Elephant, Gaur, Tiger, Panther, Sloth Bear, Deer, Porcupine, Pangolin, Civet Cat. The very thought of going into the interiors of the dark mysterious forests and living in the jungle resorts is thrilling. The jungle safaris to witness the Wild Life in Tamil Nadu will also be thoroughly enjoyable. It is just ideal for all adventure lovers. Nothing can match the excitement.